If it's not a fake, the airplane has a propeller mounted on a pylon on one side. What's the purpose of such strange design? Why does it need a propeller engine, if it already has two jet engines? Or is it a permanently deployed RAT? 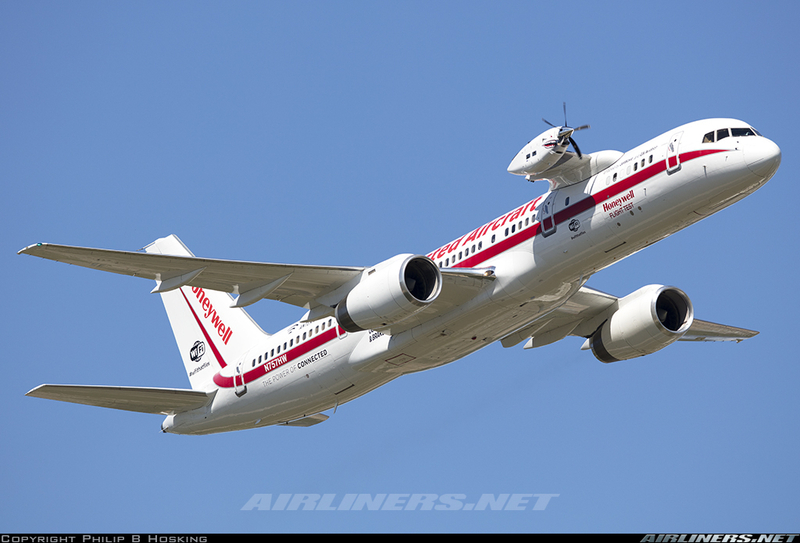 The Honeywell, Boeing 757 test bed appeared on static display for a few days before departing half way through the event. A testbed aircraft is an aircraft used for flight research or testing new equipment such as engines. You can see other photos without engine or with a jet engine instead of a propeller one. The engine is not needed to fly, but is being tested, and apparently that position has been deemed a good solution to the problem "where do we attach an extra engine we need to do tests on?". The airplane doesn't "need" that engine. It is a test platform for testing the engine during flight. Obviously, you don't want to rely on the engine you're testing, in case something goes wrong! So the plane flies with 2 large turbofan engines, while the engineers are testing the smaller engine mounted up front. If you look closely, you can even see the airplane is labeled "Flight Test". Testing a new engine design can only go so far on the ground. At some point, it has to be tested in conditions representative of actual use - in other words, in flight. You don't want to be dependent on an untested engine to get you airborne and back on the ground safely. The solution to this problem is to mount the test article on an aircraft that is entirely airworthy regardless of the operational state of the engine under test. That way the test engine can be put through its paces without compromising the safety of the test crew. Not the answer you're looking for? Browse other questions tagged aircraft-design boeing-757 or ask your own question. Why does the 757 fuselage bend more on turbulence than those of other airplanes? Which avionics suite does the 757 use? Why is the Boeing 757 undercarriage so high?